F.C.P.S. (Surgery), D.N.B, MS - General Surgery, M.B.B.S. Dr. (Maj. Gen.) Atul K. Sharma, MBBS, MS(Surgery), DNB, having eminent experience of more than 37 years, is the Chairman of Institute of Gastrointestinal Sciences and Senior Consultant- GI, Laparoscopic & Bariatric Surgery. He was formerly Professor of Surgery at AFMC and Dean of Army College of Medical Sciences. Dr. Atul K. Sharma is an alumnus of prestigious institute, Armed Forces Medical College, Pune, where he completed his basic medical studies & post graduation, i.e. MS- General Surgery and was awarded the Diplomate of the National Board (DNB) in 1983. 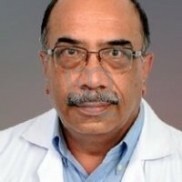 Thereafter, he achieved two year Post-Doctoral Fellowship in Gastrointestinal Surgery at the Department of Gastrointestinal Surgery & Liver Transplantation, AIIMS, New Delhi and was a visiting scholar at the Dumont-UCLA Liver & Pancreas Transplant Centre, UCLA School of Medicine, Los Angeles, CA, USA. To his credits, he has been honoured with Ati Vishisht Seva Medal (AVSM) by the President of India on 26 January 2014, for serving the nation for 37 years devotedly & meritoriously . He was the first surgeon to perform Bariatric (weight -loss) Surgery in the Armed Forces and has a large number of very satisfied and grateful patients on follow-up. Over and above, he is examiner for M.Ch - G I Surgery at AIIMS. Maj. Gen. (Dr) Atul K Sharma has established the Advanced Laparoscopy Service at the Dept. of GI Surgery, Army Hospital (R&R), Delhi, and has mentored a number of GI Surgeons in techniques of minimal access surgery in the various Command Hospitals of the Armed Forces Medical Services. He has perfected both the conventional and laparoscopic operations for Gallstones, oesophageal, gastric, hepato-biliary and colon-rectal cancer.